The North Carolina State University Herbarium (NCSC) was founded in 1898 and now comprises over 130,000 specimens, making it the 3rd largest collection in North Carolina and 2nd oldest of collections over 100,000 specimens. Throughout its history, the herbarium has been used to provide extension services to the citizens of North Carolina, to conduct plant taxonomic research, and to train the next generation of researchers. The brief history given here is an adaptation of the work published in the Journal of Elisha Mitchell Scientific Society 117 (4): 224-239 (with permission from the NC Academy of Science). Before the turn of the 19th century, two institutional herbaria existed in Raleigh. The oldest was initiated by the first State Botanist, Gerald McCarthy (Ehrenfeld et al., 1998; Troyer, 1999), and housed at the Agricultural Experiment Station. McCarthy (1888) described an herbarium of about 2,500 species. The fate of this collection has not been properly documented and remains unclear. So far, only a few specimens collected by McCarthy have been found at NCSC. As a result of political events and the integration of the Agricultural Experiment Station and the botanical and horticultural programs of the North Carolina College of Agriculture and Mechanic Arts (NC A&M) (see Troyer, 1999), McCarthy was replaced by Charles Walter Hyams, who served as Assistant Botanist under Wilbur Fisk Massey (Troyer, 2000). Working toward the compilation of a North Carolina flora (the most recent since Curtis, 1867), Hyams and Massey began amassing specimens through collection and exchange (Massey, 1899, 1900). Although referred to in several reports from 1898 onward, Massey clearly states in a 1900 report that “our herbarium was begun two years ago” (Massey, 1900). A list of 865 species for exchange was published by Hyams in December 1898 (Hyams, 1898) and a flora in 1899 (Hyams, 1899). The NC A&M collection is believed to have reached at least 3,485 specimens in size by 1900 (True and Clark, 1900), many of which survived and form the core of the present NCSC collection. Sheets from this collection are readily recognized by the “Herbarium of North Carolina College of Agriculture and Mechanic Arts” stamp and labels. Apparently, no accession numbers were used. Among collections of 100,000 specimens or more, NCSC is thus the second oldest in North Carolina. 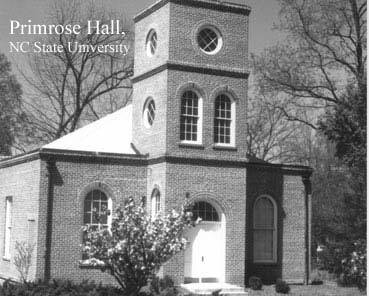 Although published as founded in 1903 (Holmgren et al., 1990), minutes of the University of North Carolina Board of Trustees (Holmes, 1888) reveal that a herbarium collection has been at the University of North Carolina – Chapel Hill (NCU) since at least 1888. The herbarium of Duke University (DUKE) was founded in 1932 (Holmgren et al., 1990). Founded in 1820, the ca. 1,000 specimen Salem College collection (SC) remains the oldest herbarium in North Carolina (Mowbray, unpubl.). The early NC A&M herbarium collections appear to have been primarily organized by Hyams (Massey, 1900) and were stored in Primrose Hall. The first agricultural building of the University, Primrose Hall was completed in 1896 and occupied entirely by Massey and his botanical and horticultural programs (Troyer, pers. comm.). The herbarium and agricultural programs moved into the newly constructed Patterson Hall (“Agricultural Hall”) in 1905 and resided there until the start of World War II. Although somewhat of a gray area, the present-day Department of Botany can trace its roots to this period. Prior to B.W. Wells’ arrival in 1919, Frederick Adolphus Wolf, a plant pathologist, had been the sole faculty in this area. As Wolf stepped down from teaching to return to research, Wells accepted the position of Professor and first official Head of the now two facultied “Department of Botany and Plant Pathology.” This Department moved to temporary quarters on the top floor of Winston Hall in 1940. Winston Hall became the building in which Fox initially met, organized, and eventually expanded the collections. Although only a completed catalogue can provide more precise figures, it appears that on his arrival, Fox probably met a collection of 5,000-6,000 specimens, comprised of the early NC A&M specimens and subsequent departmental collections from Wells, Shunk, Buell, and others. Supporting evidence comes from low accession numbers, on both early departmental and early NC A&M collections, which follow a systematic arrangement from lower vascular plants to gymnosperms, to monocots, then dicots. Accession numbers increase steadily up to about the 6,000 range through the taxonomic arrangement, suggesting specimen existence in one set prior to being systematically stamped with accession numbers. The herbarium ultimately moved to its present location in the newly built Gardner Hall in the fall of 1952. Tragically, Fox died shortly thereafter, in November of that year. William Basil Fox, born in Talcott, West Virginia, received his doctorate from the University of Iowa in 1942 and subsequently served as a technical radar instructor for the U.S. War Department from 1942-1945. 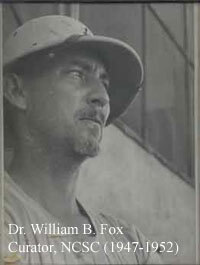 Following a one year stint as Assistant Agronomist at the Experiment Station of the State College of Washington, Fox joined the North Carolina State University (then N.C. State College) Department of Botany as Assistant professor in 1946 and became the first curator of NCSC in 1947. Departmental faculty, such as B.W. Wells, I.V. Shunk, and M.F. Buell, had maintained collections prior to his arrival, for teaching purposes or associated with various ecological research (Whitford, unpubl.). It was Fox who first took to systematically arranging the collection and keeping accession records. Although it remains unclear how many specimens Fox collected, preliminary data resulting from recent cataloguing efforts show Fox to have collected about 15 % (n = 482) of the 3326 specimens captured. Praised by contemporaries for his teaching and investigation skills (Whitford, unpubl. ; Lynch, 1952), Fox’s tenure at NCSC was prematurely cut short in November 1952 by his accidental death at the hands of his not quite five year old son. The tragedy occurred early one morning after Fox had turned over to return to sleep after playing with his son. The child took the .22 caliber rifle, which Fox sometimes used to shoot twigs off trees for collecting, out of the closet and, not realizing it was loaded, shot him in the back of the head. Fox was 37 at the time. He was laid to rest in New Hope Cemetery, Talcott, West Virginia. Following Fox’s death, Robert Lynch Wilbur became the second curator of NCSC. Wilbur was born in Annapolis, Maryland in 1925 and educated at Duke University and the University of Michigan. Receiving his doctorate from the latter in 1952, Wilbur briefly served as Assistant Professor at the University of Georgia (1952-1953), before accepting appointment as Assistant Professor and Curator in the Department of Botany at North Carolina State College. Wilbur contributed significantly to the collections, particularly to the holdings of Fabaceae. Significant publications resulting from work at NCSC include the description of novelties in the southeastern flora (e.g., Wilbur, 1955), as well as the completion of a work on North Carolina legumes initiated by W.B. Fox (Wilbur, 1963). Wilbur accepted a curatorial appointment at Duke University in 1957, where he continues to serve as Professor of Biology. The most significant period of NCSC’s growth and contribution to the floristic knowledge of North Carolina, aside from the early years of Fox, occurred during the tenure of James Walker Hardin. Born in 1929 in Charlotte, North Carolina, Hardin received his doctorate in 1957 from the University of Michigan and subsequently accepted appointment as Assistant Professor and Curator at North Carolina State College. 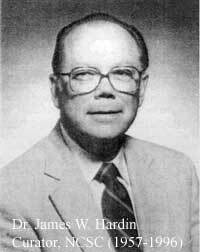 A respected educator and researcher, Hardin published broadly on southeastern plants, with interests ranging from poisonous plants to the taxonomy of trees, shrubs, and herbs, to the micro-morphology of foliar surfaces (e.g., Hardin, 1961a, 1961b; Hardin and Cooper, 1967; Hardin and Arena, 1969; Hardin, 1971; Hardin, 1975; Hardin and Phillips, 1985; Hardin, 1990; Hardin, 1992). Hardin also oversaw the floristic exploration of many under-collected regions and parks of North Carolina, undertaken through thesis projects by his many graduate students. Numerous exchanges continued or were initiated during his tenure involving at least 30 institutions from the United States and abroad. Several private and state collections were also transferred to NCSC at this time (see “Preliminary annotated list of significant collectors and collections” below). 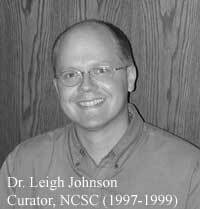 Leigh Johnson joined the NC State University botany department in 1997, subsequent to obtaining a doctorate from Washington State University in 1996. Interested in using molecular data to reconstruct phylogenetic relationships and to identify patterns of diversification, Johnson primarily concentrated on taxa of the Polemoniaceae as models for his questions. During Johnson’s brief tenure at NCSC, the collections grew primarily through continued exchanges, as well as collections by his doctoral student Jennifer Floyd, who had previously been actively engaged in North Carolina collection efforts while a master’s student of J.W. Hardin (Floyd, 1996). Significant investments were made in updating technologies through the addition of a -20° C freezer, computer equipment, a loan management database, and webpage development. Johnson left the botany department in 1999 to accept appointment as Assistant Professor of Botany at Brigham Young University. Following the departure of Leigh Johnson, the future of the herbarium appeared somewhat uncertain. Without a curator, the two most basic herbarium functions, extension plant identification and loan management, were assumed on an interim basis by Jon Stucky (Department of Botany) and Paul Fantz (Department of Horticultural Science), respectively. Local botanist, Ed Swab, was hired to also perform extension plant identifications for a period of time. The tenuous future of the herbarium was ultimately steadied by a decision to create a new, non-tenure track curator position, separate from the tenure-track, plant systematics professorship, which had in the past included curatorial responsibilities. The newly-created position of Curator and Plant Taxonomist was filled in late July 2000 with the appointment of the author. 1. Moses Ashley Curtis (b. 1808-d. 1872): Curtis collected numerous vascular plant and fungi specimens and ultimately published a flora of North Carolina (Curtis, 1867). NCSC holdings of Curtis material date to the 1830’s and 40’s. Correspondence, both personal and professional (with other botanists such as Henry William Ravenel, Asa Gray, and Miles Joseph Berkeley), as well as some botanical notes, are housed in the Southern Historical Collection of the University of North Carolina, Chapel Hill. 2. James Mooney (b. 1861-d. 1921): Mooney, an ethnologist with the Bureau of American Ethnology, was primarily interested in the anthropology of coastal Atlantic tribes, such as the Kiowa and Cheyenne, in addition to the Cherokee. Mooney collected nearly 500 plants associated with a study of tribal medicine from the Qualla Cherokee reservation in 1888 (Powell, 1893). Duplicates are deposited at NCSC. 3. Charles Walter Hyams (b. 1863-d. 1941): Hyams began the first herbarium of the North Carolina College of Agriculture and Mechanic Arts in 1898. Many specimens from this herbarium survive (although the exact number remains to be determined) and form part of the core collection W. B. Fox originally met on his arrival at the College in 1946. A brief biography of Hyams, as well as of his botanist father Mordecai E. Hyams, appears in Powell (1988). 4. Carl Alwin Schenck (b. 1868-d. 1955): Schenck, founder of the first forestry school in the United States in Biltmore, North Carolina, trained the first generation of American foresters (Schenck, 1974). The NCSU library contains a collection of Schenck’s library and correspondence. A set of 384 tree and shrub specimens collected from European arboreta around the turn of the century was accessioned by NCSC under J.W. Hardin. 5. Bertram Whittier Wells (b. 1884-d. 1978): A noted ecologist (Troyer 1986), Wells joined NC State College in 1919 as Professor and Head of the Department of Botany and Plant Pathology and remained there for the duration of his career. A keen observer of environment, Wells’ collection is important historically as the basis for numerous ecological contributions (e.g., Wells, 1920, 1921, 1931, 1939; Wells and Shunk, 1931; Wells and Boyce, 1954). The NC State University library houses his research correspondence, a reprint of his “Carolina Bays: Additional Data on Their Origin, Age and History” (co-authored with Boyce), as well as a type-written list of his paintings given to friends. A complete set of his plant collections from 1919 onward is believed to reside at NCSC. Collections of his graduate student Stephen G. Boyce, noted for his monograph on the coastal salt spray communities (Boyce, 1954), also reside at NCSC. 6. Biltmore Herbarium: North Carolina collections from the turn of the 19th to 20th century. NCSC hosts numerous herbarium sheets, although an exact number has not yet been determined. With accession numbers in the 20,000 and above range, the material was likely obtained under the administration of Fox. 7. Larry Alston Whitford (b. 1902-d. 1995): Whitford, a phycologist, also collected numerous vascular plants (many on trips with W.B. Fox). Troyer (1995) provided biographical information, as well as a list of Whitford’s research publications (e.g., Whitford and Schumacher, 1973). A complete set of his collections is thought to reside at NCSC. 8. Murray Fife Buell (b. 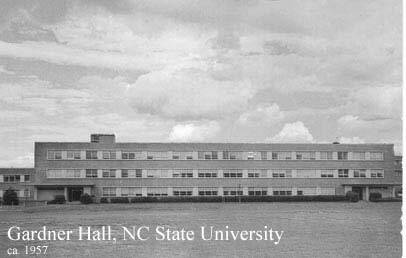 1905-d. 1975): Buell was a member of the botany department of NC State College from 1938-1946, before accepting a post at Rutgers University. 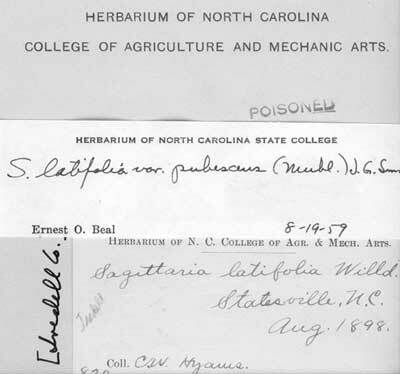 Designated to teach plant physiology at NC State, Buell apparently first asked for an herbarium cabinet! A complete set of his collections during his tenure at the NC State is thought to reside at NCSC. 9. Robert Kenneth Godfrey (b. 1911-d. 2000): An Assistant Professor of Botany at NC State University from 1947-1954, Godfrey showed a particular interest in composites and aquatic plants, although often collecting widely both geographically and taxonomically with W.B. Fox. Extrapolated preliminary cataloguing efforts suggest that Godfrey is either principal collector or part of the collection team for about 13 % of NCSC’s holdings. A complete set of his collections toward his work The Compositae of Wake County, North Carolina, in time and space (Godfrey, 1938) is thought to reside at NCSC. 10. William Basil Fox (b. 1915-d. 1952): Fox, the first curator of NCSC, collected widely in North Carolina, both geographically and taxonomically. Extrapolated preliminary cataloguing efforts suggest that Fox is either the principal collector or part of the collection team for about 15 % of NCSC’s holdings. Fox’s collections date from 1947-1952. A complete set resides at NCSC. 11. Robert Lynch Wilbur (b. 1925- ): During his four year tenure at NC State, Wilbur collected broadly across taxonomic groups, but amassed a particular collection of legumes. Significant publications resulting from work at NCSC include the description of novelties in the southeastern flora (e.g., Wilbur, 1955), as well as the completion of a work on North Carolina legumes initiated by W.B. Fox (Wilbur, 1963). A complete set of his collections from the years 1953-1957 is believed to reside at NCSC. 12. Ernest Oscar Beal (b. 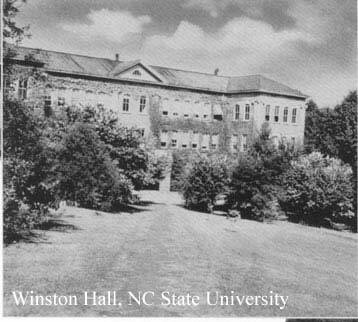 1928-d. 1980): Beal joined the botany department of NC State College in 1954. Interested primarily in aquatic and wetland vegetation, Beal was a prolific collector of these groups. Of particular note is his careful measurement of habitat environmental parameters, such as pH, Cl ppm, C s(20), and O.M. (%), which appear on every label and ultimately are compiled in his illustrated Manual of Marsh and Aquatic Vascular Plants of North Carolina With Habitat Data (Beal, 1977). Taxonomically, Beal was primarily interested in Nuphar and Sagittaria (e.g., DePoe and Beal, 1969; Beal and Southall 1977; Beal et al., 1982), although he also published novelties in other groups (Beal, 1971). A complete set of Beal’s collections, both toward the aforementioned manual and the systematics of Nuphar (at least those collected during his residency at NCSU), are believed to reside at NCSC. 13. James Walker Hardin (b. 1929- ): Interested in many groups taxonomically (e.g., Hardin, 1961b, 1971, 1975, 1990, 1992; Hardin and Phillips, 1985), Hardin collected broadly, but amassed a particularly strong dendrological collection and numerous county novelties (e.g., Racine and Hardin, 1975). About 3200 specimens are thought to reside at NCSC (Hardin, pers. comm.). 14. Arthur Cooper (b. 1931- ): Although Professor Emeritus of Forestry (NC State University), Cooper served as a member of the Department of Botany from 1958-1971. During this time, he collected broadly taxonomically and geographically in North Carolina compiling a collection of 2957 specimens (Cooper, pers. comm.). 15. Robert Marshall Downs (b. 1935-): Former botanist for the North Carolina Museum of Science. Downs and associates collected widely geographically and taxonomically in North Carolina The entire herbarium, comprising 4136 sheets collected over the years 1970-1973, was transferred to NCSC on the elimination of the botanist position at the museum. A complete museum accession record resides at NCSC. 16. Edward Croom, Jr. (b. 1948-): A graduate student of J.W. Hardin, Croom conducted the only known ethnobotanical/medicinal study of the Lumbee Indians in North Carolina (Croom, 1982). A complete set of his collections, resides at NCSC and serves as an important ethnobotanical voucher. 17. Various collections resulting from the compilation of various local florulas (alphabetical by author): Blair, 1967 (Beaufort Co.); Bradshaw, 1987 (Lost Cove, Avery Co.); Bruton, 1968 (Cliffs of the Neuse State Park, Wayne Co.); Corda, 1982 (Goosecreek State Park, Beaufort Co.); Dumond, 1969 (Chattooga River Gorge, Macon and Jackson counties); Edens, 1973 (Cranberry Glades, West Virginia); Floyd, 1996 (Medoc Mountain State Park, Halifax Co.); Hartshorn, 1968 (southern Beaufort Co.); Ingle, 1993 (Granite outcrops eastern North Carolina, Anson, Harnett, Granville, Vance, Northampton, Franklin, and Wake counties); Jones, 1971 (Yates Mill Pond, Wake Co.); Jones, 1973 (Raven Rock State Park, Harnett Co.); Kologiski, 1977 (phytosociology of the Green Swamp, Brunswick Co.); Pultorak, 1969 (northern Wake Co.); Russell, 1995 (Urban trees and maritime forest); Skean, 1982 (Durant Nature Park, Wake Co.); Smith, 1977 (South Mountain State Park, Burke Co.); Swab, 1990 (White Pines Natural Area, Chatham Co.); Taggart, 1973 (Stone Mountain State Park, Wilkes and Alleghany counties). Acknowledgments: I thank: James Troyer, Professor Emeritus (Department of Botany, NC State University), for providing leads and insight on numerous historical matters; James Hardin, Professor and Curator Emeritus (Department of Botany, NC State University), for insightful discussion regarding the herbarium and accession history; an anonymous reviewer for a very thoughtful review of the manuscript. I am also grateful for the assistance of the ILL department of the NCSU Libraries and the following folks, who contributed various historical or biographical information: Joyce Bruffey, Arthur Cooper, Lewis Deitz, Robert Downs, Leigh Johnson, and Mary Poulson. Beal, E.O. 1971. A new species of Ranunculus from North Carolina. Brittonia 23 (3):266-268. Beal, E.O. 1977. A manual of marsh and aquatic vascular plants of North Carolina with habitat data. No. Car. Agric. Exp. Stat. Tech. Bull. 247:1-298. ---------, and R.M. Southall. 1977. The taxonomic significance of experimental selection by vernalization in Nuphar (Nymphaeaceae). Syst. Bot. 2 (1):49-60. ---------, J.W. Wooten, and R.B. Kaul. 1982. Review of Sagittaria engelmanniana complex (Alismataceae) with environmental correlations. Syst. Bot. 7 (4):417-432. Blair, A.E. 1967. Vascular flora of Beaufort County, North Carolina. M.S. Thesis, No. Car. State Univ., Raleigh, NC. 70 p.
Boyce, S.G. 1954. The salt spray community. Ecol. Monogr. 24 (1):29-67. Bradshaw, T.L. 1987. Floristic survey and vegetational analysis of Lost Cove, Avery County, North Carolina. M.S. Thesis, No. Car. State Univ., Raleigh, NC. 55 p.
Bruton, C.V. 1968. Floristic survey and vegetational analysis of Cliffs of the Neuse State Park in North Carolina. M.S. Thesis, No. Car. State Univ., Raleigh, NC. 46 p.
Corda, S.L. 1982. The flora and community types of Goose Creek State Park, North Carolina. M.S. Thesis, No. Car. State Univ., Raleigh, NC. 44 p.
Croom, E. 1982. Medicinal plants of the Lumbee Indians. Ph.D. Dissertation, No. Car. State Univ., Raleigh, NC. 183 p.
Curtis, M.A. 1867. Geological and Natural History Survey of North Carolina, part. III. Botany: containing a catalogue of the indigenous and naturalized plants of the state. N. C. Institution for the Deaf, Dumb, and Blind, Raleigh, NC. 112 p.
DePoe, C.E., and E.O. Beal. 1969. Origin and maintenance of clinal variation in Nuphar (Nymphaeaceae). Brittonia 21 (1):15-28. Dumond, D.M. 1969. Floristic and vegetational survey of the Chattooga River Gorge. M.S. Thesis, No. Car. State Univ., Raleigh, NC. 62 p.
Edens, D.L. 1973. The ecology and succession of Cranberry Glades, West Virginia. Ph.D. Diss., No. Car. State Univ., Raleigh, NC. 83 p.
Ehrenfeld, E.M., M.M. Whitemire, K.E. Evans, and M.M. Reagan. 1998. Gerald McCarthy, Botanist. Road House Press, Round Pond, Maine. 78 p.
Floyd, J.W. 1996. The vascular flora of Medoc Mountain State Park, Halifax County, North Carolina. J. Elisha Mitchell Sci. Soc. 112:45-72. Godfrey, R.K. 1938. The Compositae of Wake County, North Carolina, in time and space. M.S. Thesis, No. Car. State Univ., Raleigh, NC. 99 p.
Hardin, J.W. 1961a. Poisonous plants of North Carolina. NC Agric. Exp. Sta. Bull. 414:1-128. ---------. 1961b. A hybrid population of Habenaria and variation in H. blephariglottis. Castanea 26:120-123. ---------. 1971. Studies in the southeastern United States flora. I. Betulaceae. J. Elisha Mitchell Sci. Soc. 87:39-41. ---------. 1975. Hybridization and introgression in Quercus alba. J. Arnold Arbor. 56:336-363. ---------. 1983. NCSC vascular plant herbarium. Association of Systematics Collections Newsletter 11 (6):66-67. ---------. 1990. Variation patterns and recognition of varieties in Tilia americana s.l. Syst. Bot. 15:33-48. ---------. 1992. Foliar morphology of the common trees of North Carolina and adjacent states. NC Agricultural Research Service Technical Bulletin 298, Raleigh, NC. 135 p.
---------, and J.M. Arena. 1969. Human poisoning from Native and Cultivated Plants. Duke University Press, Durham, NC. 167 p.
---------, and A.W. Cooper. 1967. Mountain disjuncts in the Eastern Piedmont of North Carolina. J. Elisha Mitchell Sci. Soc. 83:139-150. ---------, and L.L. Phillips. 1985. Hybridization in eastern North American Rhus (Anacardiaceae). ASB Bull. 32:99-106. Hartshorn, G.S. 1968. Vegetation patterns in southern Beaufort County, North Carolina. M.S. Thesis, No. Car. State Univ., Raleigh, NC. 98 p.
Holmes, J.A. 1888. Report of the professor. Extracts from the Reports of the Professors of the University, appended by President Battle to his report. Records of the Board of Trustees of the Univ. No. Car., Chapel Hill, NC. p. 343. Holmgren, P.K., N.H. Holmgren, and L.C. Barnett. 1990. Index Herbariorum. New York Botanical Garden, NY. 693 p.
Hyams, C.W. 1898. Catalogue of herbarium specimens for exchange. No. Car. Agric. Exp. Sta. Spec. Bull. 51:1-48. ---------. 1899. The flora of North Carolina from Ranunculaceae to Salviniaceae. No. Car. College Agric. Mechanic Arts, Agric. Exp. Sta., Raleigh, NC. 365 p.
Ingle, R.F. 1993. Floristic survey and biogeographical analysis of the granite outcrops of eastern North Carolina. M.S. Thesis, No. Car. State Univ., Raleigh, NC. 67 p.
Jones, S.I. 1971. Floristic survey and vegetational analysis of Yates Pond Biological Area in Wake County, North Carolina. M.S. Thesis, No. Car. State Univ., Raleigh, NC. 43 p.
Jones, T.H. 1973. Floristic survey and vegetational analysis of Raven Rock State Park, Harnett County. M.S. Thesis, No. Car. State Univ., Raleigh, NC. 42 p.
Kologiski, R.L. 1977. The phytosociology of the Green Swamp, North Carolina. Ph.D. Dissertation, No. Car. State Univ., Raleigh, NC. 169 p.
Lynch, B. 1952. .22 cal. bullet kills NCS professor. The Raleigh Times, 13 Nov.
Massey, W.F. 1899. Report of the Chief of the Divisions of Horticulture, Botany, and Entomology. Ann. Rept. No. Car. Agric. Exp. Sta. 22:XLIV-XLVI. ---------. 1900. Report of the Chief of the Divisions of Horticulture, Botany, and Entomology. Ann. Rept. No. Car. Agric. Exp. Sta. 23:XXI-XXIX. McCarthy, G. 1888. Report of the Botanist. Ann. Rept. No. Car. Agric. Exp. Sta. 11:131-144. Noggle, G.R. 1977. A History of the Botany Department, No. Car. State Univ.. Raleigh, NC. 22 p.
Powell, J.W. 1893. Tenth annual report of the Bureau of Ethnology: 1888-1889. Smiths. Inst., Washington, D.C. 742 p.
Powell, W.S. 1988. Dictionary of North Carolina Biography: Vol. 3. University of North Carolina Press, Chapel Hill. 65 p.
Pultorak, R.W. 1969. Vascular flora of northern Wake County, North Carolina. M.S. Thesis, No. Car. State Univ., Raleigh, NC. Racine, C.H., and J.W. Hardin. 1975. The vascular flora and vegetation in the Green River Gorge, North Carolina. Castanea 40:319-345. Russell, A.B. 1995. Important urban trees of North Carolina and trees of the North Carolina maritime forest and barrier islands. Ph.D. Diss., No. Car. State Univ., Raleigh, NC. 352 p.
Schenck, C.A. 1974. The birth of forestry in America: Biltmore Forest School, 1898-1913. Forest History Society, Santa Cruz, CA. 224 p.
Skean, J.D., Jr. 1982. The vascular flora and plant community types of Durant Nature Park, Wake County, North Carolina. M.S. Thesis, No. Car. State Univ., Raleigh, NC. 61 p.
Smith, E.L. 1977. Floristic survey and vegetational analysis of the South Mountains State Park, Burke County, North Carolina. M.S. Thesis, No. Car. State Univ., Raleigh, NC. 53 p.
Swab, E.C. 1990. The flora and vegetation of White Pines Natural Area, Chatham County, North Carolina. M.S. Thesis, No. Car. State Univ., Raleigh, NC. 105 p.
Taggart, J.B. 1973. Floristic survey and vegetational analysis of Stone Mountain State Park in North Carolina. M.S. Thesis, No. Car. State Univ., Raleigh, NC. 51 p.
Troyer, J.R. 1986. Bertram Whittier Wells (1884-1978): A Study in the History of North American Plant Ecology. Am. J. Botany 73 (7):1058-1078. ---------. 1995. Larry Alson Whitford (1902-1995) and the land-grant college ideal. J. Elisha Mitchell Sci. Soc. 111 (4):171-180. ---------. 1999. 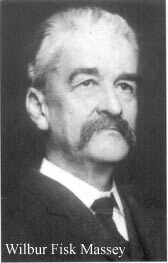 Stopped ears, open mind: Gerald McCarthy (1858-1915): North Carolina botanist. J. Elisha Mitchell Sci. Soc. 115 (4):201-212. ---------. 2000. Wilbur Fisk Massey (1839-1923): North Carolina botanist, horticulturist, and agriculturist. J. Elisha Mitchell Sci. Soc. 116 (2):101-112. True, A.C., and V.A. Clark. 1900. The agricultural experiment stations of the United States. USDA Office Exp. Sta. Bull. 80:1-636. Wells, B.W. 1920. Early stages in the development of certain Pachypsylla galls on Celtis. Am. J. Botany 7 (7): 275-285. ---------. 1921. Evolution of Zoocecidia. Bot. Gazette 71 (5):358-377. ---------. 1931. Origin of Southern Appalachian Grass Balds. Ecology 37 (3):592. ---------. 1939. A New Forest Climax: The Salt Spray Climax of Smith Island, N.C. Bull. Torrey Bot. Club 66 (9):629-634. ---------, and I. V. Shunk. 1931. The Vegetation and Habitat Factors of the Coarser Sands of the North Carolina Coastal Plain: An Ecological Study. Ecol. Monogr. 1 (4):465-520. ---------, and S. G. Boyce. 1954. Carolina Bay Lakes: The Bog Margin Problem. Ecology 35 (4):584. Whitford, L.A., and G.J. Schumacher. 1973. A manual of fresh-water algae. Sparks Press, Raleigh, NC. 324 p.
Wilbur, R.L. 1955. An undescribed dwarf species of Amorpha from Georgia. Rhodora 56:261-265. ---------. 1963. Leguminous plants of North Carolina. No. Car. Agric. Exp. Sta. Tech. Bull. 151:1-294. 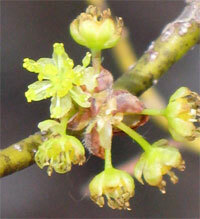 Male flowers of the endangered Lindera melissifolia (Lauraceae). This clonal shrub is exceedingly rare in North Carolina and associated with Carolina bays.